Antiquities Act • Utah lawmakers endorse resolution against "unilateral" designation; guv adds bill to special session. Al Hartmann | The Salt Lake Tribune San Juan County County Commissioner Rebecca Benally, a Navajo tribal member, urges the Commission for the Stewardship of Public Lands to pass the Antiquities Act resolution. She went on record that a Bear's Ears National Monument would be devestating to San Juan County which already has five monuments. 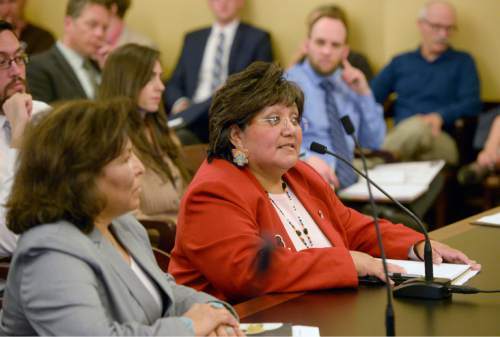 Al Hartmann | The Salt Lake Tribune Ute Councilwoman Regina Lopez-Whiteskunk, with the Bears Ears Inter-tribal Coalition says that she supports the proposal to create a Bears Ears National Monument at the Commission for the Stewardship of Public Lands that met at the state capitol Wed. April 20. 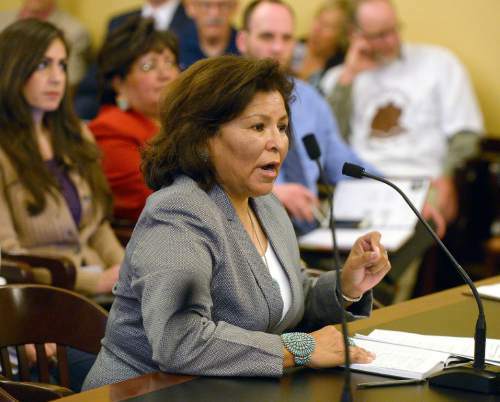 Al Hartmann | The Salt Lake Tribune San Juan County County Commissioner Rebecca Benally, a Navajo tribal member, urges the Commission for the Stewardship of Public Lands to pass the Antiquities Act resolution. She went on record that a Bear's Ears National Monument would be devestating to San Juan County which already has five monuments. Al Hartmann | The Salt Lake Tribune San Juan County County Commissioner Rebecca Benally, a Navajo tribal member, urges the Commission for the Stewardship of Public Lands to pass the Antiquities Act resolution. She went on record that a Bear's Ears National Monument would be devestating to San Juan County which already has five monuments. Al Hartmann | The Salt Lake Tribune Rep. Melvin Brown, R-Coalville, left, and Rep. Mike Noel, R-Kanab huddle in discussion as members of the Commission for the Stewardship of Public Lands debate revealing information from a law firm that would take Utah's case against the federal government in taking back federal land in the state. Al Hartmann | The Salt Lake Tribune Sen. Jim Dabakis, D-Salt Lake City, right, a member of the Commission for the Stewardship of Public Lands angrily asks why no one aside from chairmen Senator David Hinkins, R- Orangeville, left, Rep. Kevin Stratton, R-Orem, center, the governor and attorney general have access to legal papers from lawyers who would lead the state's land fight that would cost nearly 14 million dollars. Al Hartmann | The Salt Lake Tribune Members of the conservation groups protest before the start of meeting of the Commission for the Stewardship of Public Lands at the Utah state Capitol Wed. April 20 where a resolution condeming the Antiquities Act was expected to pass. Also in contention as part of the Antiquities Act is a proposal before President Obama setting aside hundreds of thousands of acres in San Juan County for a Bear's Ears National Monument. Most in the audience were for the Bear's Ears National Monument. Al Hartmann | The Salt Lake Tribune Sen. Jim Dabakis, D-Salt Lake City, right, a member of the Commission for the Stewardship of Public Lands angrily asks why no one aside from chairmen Senator David Hinkins, R- Orangeville, left, Rep. Kevin Stratton, R-Orem, center, the governor and attorney general have access to legal papers from lawyers who would lead the state's land fight that would cost nearly 14 million dollars. 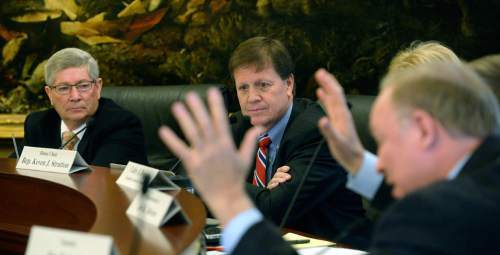 Al Hartmann | The Salt Lake Tribune Sen. Jim Dabakis, D-Salt Lake City, right, a member of the Commission for the Stewardship of Public Lands angrily asks why no one aside from chairmen Senator David Hinkins, R- Orangeville, Rep. Kevin Stratton, R-Orem, the governor and attorney general have access to legal papers from lawyers who would lead the state's land fight that would cost nearly 14 million dollars. 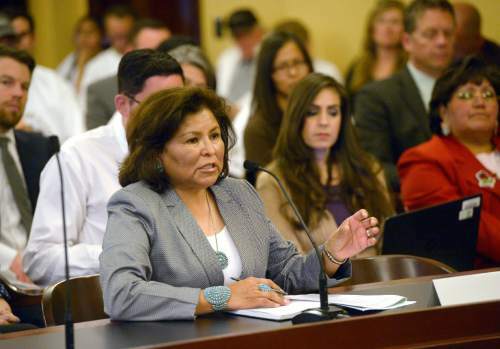 Al Hartmann | The Salt Lake Tribune San Juan County County Commissioner Rebecca Benally, a Navajo tribal member, urges the Commission for the Stewardship of Public Lands to pass the Antiquities Act resolution. She went on record that a Bear's Ears National Monument would be devestating to San Juan County which already has five monuments. 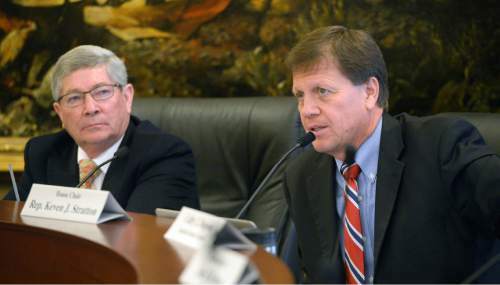 Al Hartmann | The Salt Lake Tribune Senator David Hinkins, R- Orangeville, left, and Rep. Kevin Stratton, R-Orem, chairmen of the Commission for the Stewardship of Public Lands discuss Utah's funding the state's fight to take back federal land for Utah. Democrats on the commission were incensed that no one aside from Hinkins, Stratton, the governor and attorney general have access to legal papers from lawyers who would lead the land fight that would cost the state nearly 14 million dollars. Al Hartmann | The Salt Lake Tribune Sen. Jim Dabakis, D-Salt Lake City, right, a member of the Commission for the Stewardship of Public Lands angrily asks why no one aside from chairmen Senator David Hinkins, R- Orangeville, Rep. Kevin Stratton, R-Orem, the governor and attorney general have access to legal papers from lawyers who would lead the state's land fight that would cost nearly 14 million dollars. 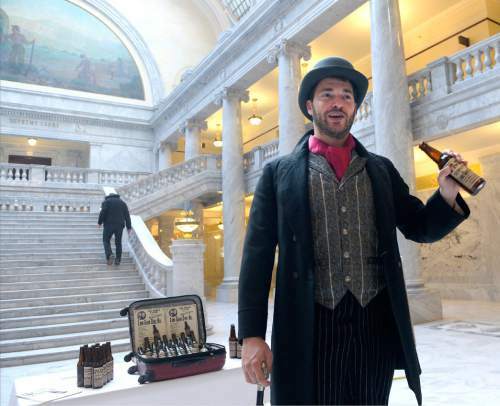 Al Hartmann | The Salt Lake Tribune Actor for Western Values Project, portraying a snake oil salesman, mocks Rep. Ken Ivory, and Congressman Rob Bishop at the Capitol before the 9 a.m. meeting of the Commission for the Stewardship of Public Lands where a resolution condeming the Antiquities Act was expected to pass. Also in contention as part of the Antiquities Act is a proposal before President Obama setting aside hundreds of thousands of acres in San Juan County for a Bear's Ears National Monument. 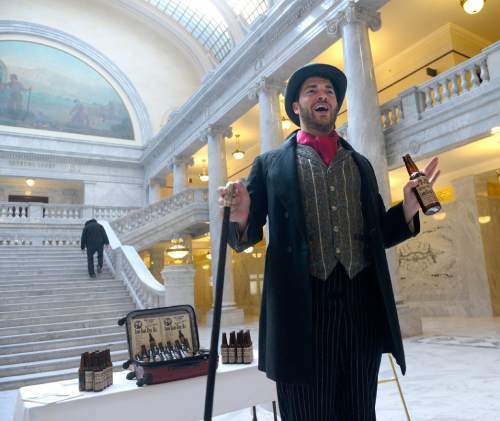 Al Hartmann | The Salt Lake Tribune Actor for Western Values Project, portraying a snake oil salesman, mocks Rep. Ken Ivory, and Congressman Rob Bishop at the Capitol before the 9 a.m. meeting of the Commission for the Stewardship of Public Lands where a resolution condeming the Antiquities Act was expected to pass. Also in contention as part of the Antiquities Act is a proposal before President Obama setting aside hundreds of thousands of acres in San Juan County for a Bear's Ears National Monument. 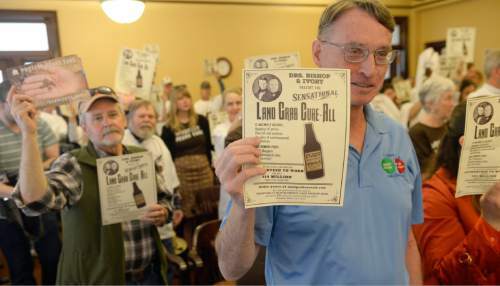 Al Hartmann | The Salt Lake Tribune Members of the conservation community protest before the start of meeting of the Commission for the Stewardship of Public Lands at the Utah state Capitol Wed. April 20 where a resolution condeming the Antiquities Act was expected to pass. Also in contention as part of the Antiquities Act is a proposal before President Obama setting aside hundreds of thousands of acres in San Juan County for a Bear's Ears National Monument. Most in the audience were for the Bear's Ears National Monument. The legislative commission overseeing Utah&apos;s land-transfer efforts passed two controversial resolutions Wednesday, opposing "unilateral use" of the Antiquities Act to designate national monuments in Utah and calling for a lawsuit against the federal government to demand control of 31 million acres of public land. 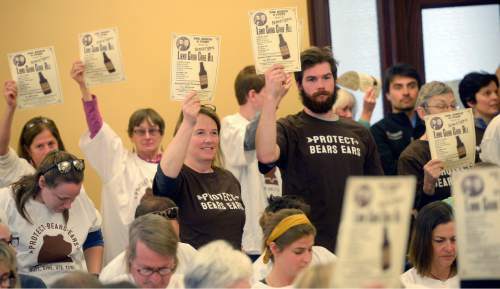 Dozens of supporters of the Bears Ears monument proposal, pushed by several tribal groups, crammed the Capitol room where the Commission for the Stewardship of Public Lands conducted a contentious meeting that often devolved into partisan bickering and name-calling. Rep. Mike Noel, R-Kanab, blasted audience members, many of them Salt Lake City conservationists, as "selfish and greedy" for trying to impose their will on residents of southeastern Utah who would have to live with the 1.9-million-acre monument. Noel and other Utah leaders are convinced President Barack Obama will make such a designation in the coming months and cited Interior Secretary Sally Jewell&apos;s Tuesday announcement of a "major course correction" for conservation and a visit to Utah this summer. Utah Dine Bikeyah, a nonprofit led by Navajos who follow traditional spiritual practices, has spearheaded the monument idea, which has been embraced by the leadership of two dozen other tribes, many of which can trace ancestral ties to the land around Cedar Mesa and the Abajos. These lands, which harbor tens of thousands of archaeological sites, are considered sacred, and members of a variety of tribes visit to gather herbs and firewood and pursue spiritual experiences. But Noel and other critics say Utah Dine Bikeyah does not represent American Indians who live in Utah, and is really a front for environmental groups whose true aim is to shut down public access. An investigation into the group&apos;s funding is in the works, Noel said. Some tribal leaders call such allegations "insulting and false." For the past several years, Utah Dine Bikeyah has sought conservation status for the land surrounding the Bears Ears buttes and has nurtured buy-in from numerous tribes that have not always gotten along with the Navajo. Access for traditional activities and a management framework that give tribes a say are core elements of their proposal. But San Juan County Commissioner Rebecca Benally, a Navajo and a Democrat, said Wednesday that a monument will curtail Native Americans&apos; use of the land and bring further harm to what is already Utah&apos;s most economically distressed region, plagued with high rates of suicide and unemployment. "A national monument will be a devastation for San Juan County," Benally said. "Speaking on behalf of my elders and descendants, they truly and heartfelt request that they do not want a monument. We already have three." Those monuments  Rainbow Bridge, Natural Bridges and Hovenweep  have not improved the unemployment rate, and neither would a fourth, she said. Ute Mountain Ute Tribal Councilwoman Regina Lopez-Whiteskunk, co-chairwoman of the Bears Ears Inter-Tribal Coalition, spoke in support of monument protection and uniting the tribes on this issue. "We have to come together and reach across reservation and state boundary lines and other unwritten lines between one another, that we come together to find a solution," she said. "We need to protect it now. We don&apos;t need to do it several years down the road. It is something that desperately needs to be addressed." Several of the other elected Utah tribal leaders who do support the monument, including Navajo Nation Council delegates Herman Daniels and Davis Filfred, were at a council session Wednesday in Window Rock, Ariz.
Monument proponents say Cedar Mesa is being trashed by off-roaders and pot hunters; looting and grave desecration are on the rise. Cynthia Wilson, Utah Dine Bikeyah&apos;s outreach director, said six of the seven Navajo chapter houses in Utah have endorsed Bears Ears. Yet commission co-Chairman Sen. David Hinkins, whose Senate district covers San Juan County, said he has seen no support among Utah Navajo. "I have gone to all the chapter houses and talked to all the leaders. I don&apos;t feel that is the case at all," said Hinkins, R-Orangeville. 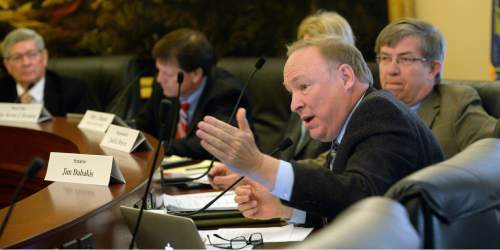 Commission co-Chairman Rep. Keven Stratton of Orem said the commission would take up the Antiquities Act resolution at a later meeting, but after Bears Ears backers left, he put the resolution out for a vote with party-line results. The resolutions are identical to two that Stratton sponsored last session and died in the Senate. "The [Antiquities Act] resolution has nothing to do with who can speak on [the Bears Ears] issue. It is the spirit of cooperation and working together with the federal legislative and executive branch. This resolution does not have anything to do with whether or not we need to protect Bears Ears or any other area. It is clear we want to do things that are right to protect and preserve the treasures that we have," Stratton said. The resolution got a strong endorsement from Gov. 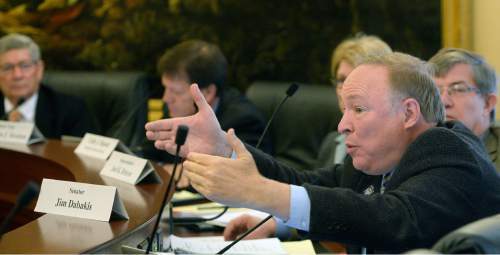 Gary Herbert, who added the bill to the agenda for a May 18 special legislative session and argued it was "absolutely irresponsible" for Obama to consider a monument without input from Utahns. "I am asking every member of the Utah State Legislature to go on record and join me in expressing our opposition to another unilateral national monument within the state," he said in a statement. "I call on President Obama to adhere to the commitments made by his staff and engage directly with Utah&apos;s elected officials and the general public on any proposed national monument in the state of Utah." 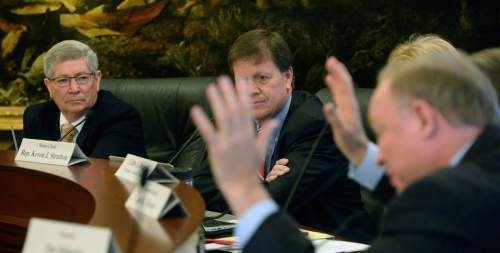 The commission&apos;s two Democrats, already angered by the co-chairs&apos; refusal to allow them to question the commission&apos;s outside legal advisers, blasted both resolutions, saying they are meaningless and would waste taxpayer money on dead-end lawsuits. "This is a political game," said Rep. Joel Briscoe of Salt Lake City. "These commission meetings are often set shows. They are carefully orchestrated with particular groups to reinforce a point of view, and they don&apos;t have the ethos to conduct a full inquiry into an issue. You saw that today."